Chinos-Love em or hate em? Chinos-They are the sort of trousers you either love or hate. Personally I've always rather worn jeans or cut offs or a dress in summer as an alternative. From previous pictures I've seen, the trend is also to wear them with high heels-wear what you like really, but wear them with attitude, to avoid that frumpy look!! Hi cate-I love the YSL look, but it can veer towards frumpy territory if not careful. I think chinos make me look way too short, but I would try them if out if I were you. I love that blue YSL vest. I want it! Chinos are essential for summer. Especially, here in the states. Of course, there comes a point when the old pair becomes walking shorts. Even better when the heat is on. Or should I say humidity. Thanks so much for linking me too. They look cool on the model but these are the kinds of pants I'd have to try on first before I purchase them. I doubt they'd look good on me though. Hi mikkle-I completely get your point-it's the same for me and black trousers. Up to now, they've been work uniform so for years I've had no desire to wear them outside work. But we're going to navy now, thats why I've invested in a couple of black smart trousers. Hi asiancajuns-I must admit, I'm still not sold on them! Maybe if the riht pair came along........! Hi ellie-pleased to link up with you!! I'm not 100% sure if I will rush out to buy a pair yet! Hi danz-you've hit the nail on the head!! These sort of trousers have to be tried on first and like you, I have my doubts about them anyway!! I like them on other people who make them look hip, but generally not on me! Hi emma-I know what you mean!! especially when other things look better on! Hi wendy-yes I agree, other girls manage to make them look so hip and stylish, but I don't think I would be able to create that in my minds eye! Thank you for noticing :) I was waiting for somebody to say they did. I felt the blog needed a new look. Glad you liked it! Hi fashionchalet-thanks for letting me know-I love the new look blog!! I personally like chinos and they're comfortable too! I actually really want a pair for the summer. I think they can go just about with anything since they're rather neutral. Hi angie hearts-yes I do agree about the comfy factor!! Hi wendy-hope you find a pair-I'm sure you will look good in them! 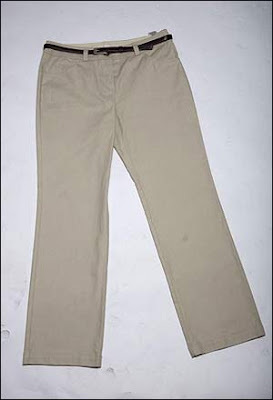 i love love love chinos! but they are hard to find a perfect fit. Hi terren-thanks for stopping by my blog!! yes getting the right fit and cut for chinos is key!! 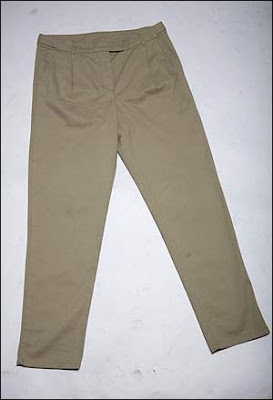 I often think about how much khakis or chinos have fallen out of favor. I used to wear them a lot, but they don't strike me as the most practical, and it's been hard to find them in a good shape for a while. Yes, I agree too, Pamcasso-I would only wear them if it was a very stylish cut and they weren't too pricey! They are a wardrobe staple in a park lane princess sense. I went for wide leg sailor styel ones this year which stop them being chinos! Hi kate-yes, I do think this style is an excellent choice-I bet they look lovely on!! Hi studentstil-yes I agree, the fit of these style of trousers is most important! Leggings-You either love 'em or hate 'em!! Net-a-Porter sale! Designer bargains under £100! That Time of Year again.......! Stripes are also in for summer!! More Dresses for Summer-Next Year!! !